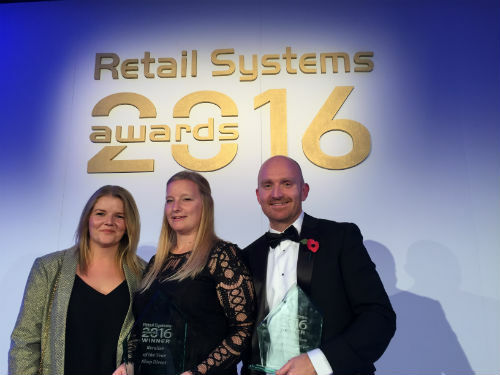 Last night RichRelevance and Shop Direct were crowned as leaders at The Retail Systems Awards at the Millennium Hotel, in Mayfair, London. RichRelevance won ‘Online Solution of the Year’ for its personalisation project with innovative retailer, Shop Direct. The winning solution was chosen for the superior online shopping experiences created for very.co.uk customers. Shop Direct were also crowned ‘Retailer of the Year’ for their Personalisation initiatives with RichRelevance. Now into their 11th year, the Retail Systems Awards recognise technology excellence and innovation within the retail sector. Winning entries come from retailers and technology suppliers who are leading the way in areas such as mobile, online, payments, loyalty and personalisation. The awards ceremony was attended by retail and technology industry leaders from across the UK. The Retail Systems’ judging panel included Clare Joel, Head of IT, French Connection Group, Nadine Sharara, E-Commerce & CRM Director, Moët Hennessy, Sharon Peters, Programme Manager International Supply Chain, Marks and Spencer and Michelle Stevens, Editor, Retail Systems. Congratulations to all the other winners of the Retail Systems Awards. A great night was had by all and we’re proud to have been among other industry leaders from across the UK at the awards ceremony in Mayfair, London.